SAN FRANCISCO (AP) — The storm that pummeled much of California for three days began moving east Thursday after causing at least six deaths, forcing wildfire victims threatened by floods to flee their homes and plunging nearly 300,000 utility customers into darkness at its peak. "It will be slamming the East Coast by Sunday," NWS forecaster Steve Anderson said. "From Maine to Florida." The three-day drenching did put a dent in California's drought. Government and university researchers who maintain the U.S. Drought Monitor map downgraded most of the state's drought classification from abnormally dry to some level of drought, mostly of moderate intensity. Californians endured canceled flights, falling trees, downed power lines and threats of localized flooding. "Our tree crews have been working around the clock to clear downed trees and large branches during the heavy rains and high winds," San Francisco's Department of Public Works said. Fallen trees blocked the city's iconic cable car tracks for hours Thursday and similarly delayed other commuter trains in region. The California Highway Patrol says a falling tree killed a 42-year-old homeless man in Oakland on Wednesday. The CHP said the victim may have been trying to shelter under some trees near an Oakland freeway when he was crushed by a 30-foot-long (9-meter) branch. The man may have been "just trying to stay dry," CHP officer Herman Baza said. 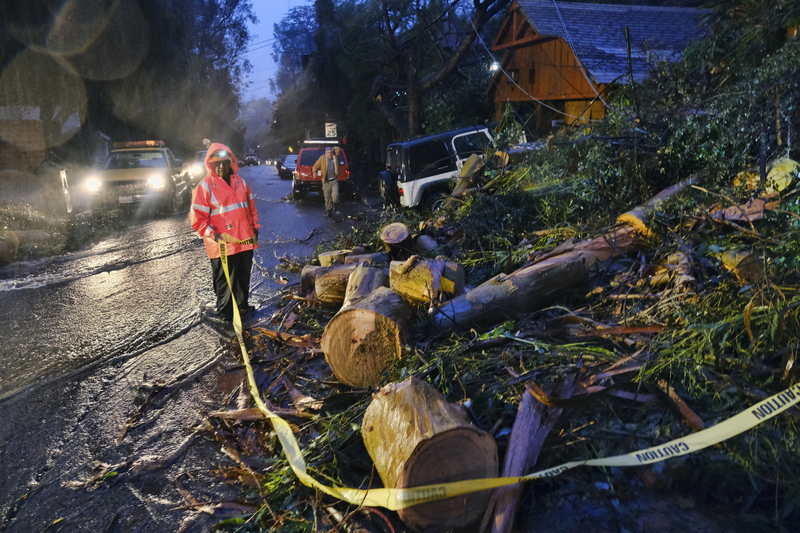 A few hours later, a pedestrian looking at a downed power line who went into the street to avoid a falling tree was struck and killed by a van in Mill Valley about 15 miles (24 kilometers) north of San Francisco. CHP reported that four people were killed in two separate Northern California auto accidents caused by rain-slickened roads this week, including a family of three killed Tuesday in the Sierra Nevada foothill town of Placerville. A 200-year-old oak tree towering 100 feet over James Holmes' suburban San Francisco home toppled over in the wind Wednesday night. "My family lived under it in our house, for 70 years," he said. Northern California authorities warned of imminent floods and debris flows in the wildfire-ravished city of Paradise and the surrounding region denuded of protective trees and vegetation, telling residents to prepare to flee on a moment's notice. Rain and winds forced the cancellation of dozens of flights at San Francisco International Airport. In the Southern California hillside community of Oak Park, where residents used pumps and sandbags to hold off rushing storm water, longtime resident Diane Starzak said her neighborhood "kind of dodged the bullet" as the worst of three days of storms began to taper off. This article was written by Paul Elias and John Antczak from The Associated Press and was legally licensed through the NewsCred publisher network. Please direct all licensing questions to legal@newscred.com.